Don’t let Robbie Rotten ruin your days and keep you doing nothing! Buy this bumper book of activity excitement and stay energised. It’s stuffed with sporty ideas, energetic things to do and ace activities to keep you live and kicking. Plus there’s a giant poster and 50 colourful stickers. So don’t be lazy. Activate! Spartacus is always on the move! Can you colour him in? 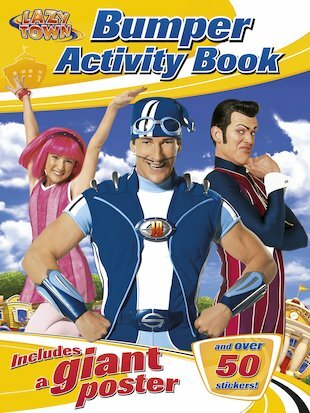 Robbie’s spying on LazyTown again, what can he see? Who is Stephanie going rollerblading with? Unravel the lines to find out! Copy Stephanie into the grid. Can you find all the residents of LazyTown in this wordsearch?